There are some moments that you want to hold on to forever, some places you want to take with you wherever you go, some things you never want to forget. 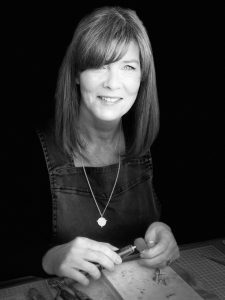 That was the inspiration for Sally, our founder, in 2009 when she created Sally Clay Jewellery: creating beautiful silver jewellery to preserve those memories, celebrate those moments, treasure those places. Our range has grown and grown since then, but that aim has never changed. You see, Sally has always loved to travel – almost as much as she loves silver. And whenever she went off exploring the world with her husband Charlie at her side, she’d consistently bring a piece of silver jewellery back. It always felt like the perfect way to remember each brilliant adventure, each magical place. But she wasn’t just collecting beautiful objects and memories: she was gathering ideas and inspiration too. She took those ideas to the studio in her rural Cambridgeshire garden and started making them real: crafting beautifully unique handmade silver jewellery. And that’s how our company was born. It’s not just Sally these days – we’re a small-but-perfect team of three dedicated to helping our customers find their perfect design, bringing that design to life with expert craftsmanship and sending the finished jewellery – gorgeously gift-wrapped – to wherever they are in the world. From telling your story in your own words to representing a special place in your life, from hidden messages to timeless designs, from the perfect cufflinks for your dream wedding to monograms and crests to wear with pride… every item is completely unique, handmade to order in our studio. Every design can be personalised to your wishes – and if you can’t see exactly what you’re looking for, we’re always happy to take on a special commission. In fact, we love to hear from you about what you want. It’s very important to us that you get something that’s both beautiful and personal. We’re as proud of our customer service as we are of our craftsmanship.